GOMACO?Corporation will introduce the world to the new 4400 ultimate barrier machine at CONEXPO-CON/AGG 2011, March 22-26, Booth #5111 in the Central Hall of the Las Vegas Convention Center in Las Vegas, Nevada, USA. The 4400 features a totally new frame design for right-side and left-side slipforming. Its new Glide control console slides from side-to-side, for ultimate operator control and visibility of the paving operation. It features GOMACO’s proprietary G+ controls, which is positively simple to understand and capable of operating in multiple languages. The new 4400 was built around the design concept of a left-side and right-side slipforming capable machine with symmetric steering and minimal set-up changes for switching profiles from side-to-side. It has the new GOMACO Barrier Hook-and-Go mold mounting system to quickly mount barrier molds up to 39.4 inches (1000 mm) tall on either side of the machine. A standard side mount is available for larger barrier. The GOMACO?barrier mold itself is designed for proper vibration and consolidation of material, with the GOMACO-exclusive trailing stainless steel for superior finishing. The barrier machine features the new 4400 series auger with the pitch and speed designed specifically for transporting low slump concrete. The sixteen inch (406 mm)?diameter auger has polyurethane, bolt-on blade liners for extended wear and protection. Its four-way hydraulic positioning capability allows the auger to be placed perfectly for concrete receiving and delivery to the mold on either side of the machine. The 4400 features a Cummins QSB3.3, 99 horsepower, Tier 3 diesel engine. 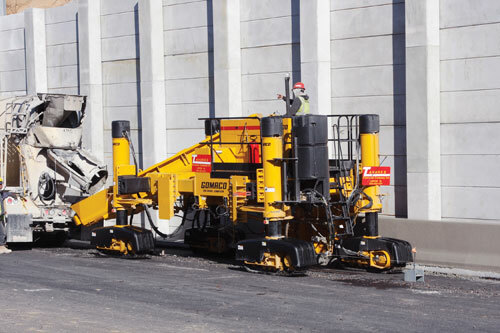 The engine is power-optimized for fuel efficiency and approximately 18 hours of continuous barrier slipform paving. The high-capacity cooling package was designed for noise reduction and provides one of the quietest working platforms in the industry. The new G+ control system coordinates the speed of the hydraulic fan with engine and hydraulic oil temperature. The tractive system on the 4400 features super low, allowing for the minimum speed and smooth crawl necessary for a standing vertical wall. The new G+ speed dial turns to adjust in deviations of one percent increments and speed display feedback allows for smooth, precision paving speed control. Its unique GOMACO U-shaped operator’s platform, with vibration isolation, puts the operator comfortably on top of the action. The U-shaped platform and side-to-side sliding console accommodate right-side and left-side pour and provide a 360 degree view of the entire paving operation. Safety is first in all of GOMACO’s design considerations. The 4400 features track guards and ground level emergency stops to keep everyone safe while working around the machine.